B-Step is a Sequencer (mentioned here before) that runs on almost deny platform and now it’s going into it’s second round – version 2.
here’s the updates and there is a lot of stuff going in like „roll/flam“ in another way – this time called ratcheting (the older word for playing some steps faster) has several new modes that allow song construction and complex polyrhythmic stuff. the trick is: it is a 4 row sequencer but you can set a number of chords / scales to it and switch them in a sequence, so you have a track for controlling those sales to be switched and therefore allow more / different chord progressions – which is in fact a minimal concept with massive control structures built around it. since this isn’t very common – check it out – it looks as a simple sequencer but can do whole songs – .. you can control it by 1-2 Launchpads (even on the tablet) and have full control during the performance..
We kept the B-Step 1 base and built a lot of exciting stuff on top of that. For the right groove in your set, we have added an advanced shuffle mode. Now you can add the shuffle modifications to every second 16th, 8th or 4th. You can modify the timing, velocity and duration of the notes in the shuffle grid. 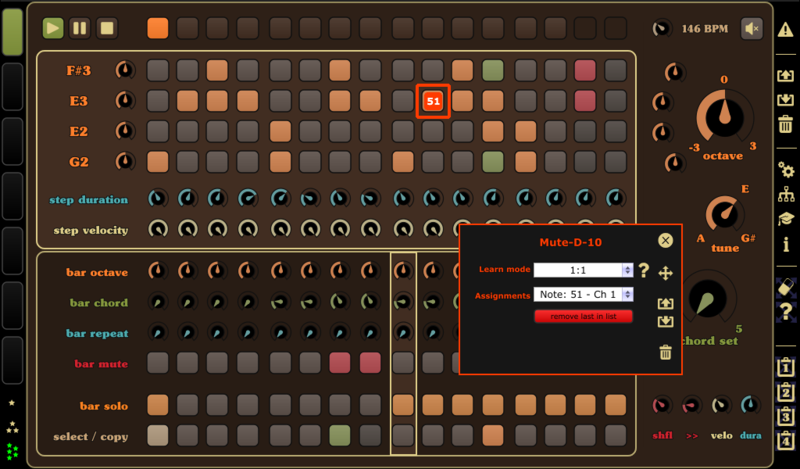 To fill the pattern, you can use the Sequencer Ratcheting features (Step Repeats). 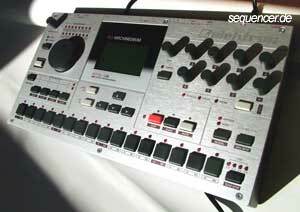 This is ideal when you want to create drum rolls, arpeggios or experimental stuff. Different measurements? Sure! You can reduce the pattern length down to 1/16th or increase the length by adding some Non-Linear Playback features. Polyphony: control up to 4 synthesizers independently with one instance of B-Step. Just split it into 4 sequence groups and share the things you like between. Scales? We have that covered also. You can fill the chords randomly with notes from scales. And that’s only the major things! Just try it out. Download your free trial version. – Monophon and Polyphon playback modes. – Random chords from scales (12 scales included). – 5×6 chords per project. – Clean and simple user interface. – Pattern auto chaining or define sequences manual. – Advanced pattern and sequence playback features. – Measurements by default 4/4th (possible from 1/16th to much more than 4/4th). – Send Control and Program Changes at each step. 16 OSCs drum sample + virtual analog, 2 LFOs, 16 EGs, 1 FILTERs (4pole), TR sequencer, no arpeggiator more..